Today I learned to weave-it on a Weave-It Loom! I am hoping that I am not the only person east of the Grand Canyon who didn't know what a Weave-It loom was before this month. At 63 I kind of thought I knew everything, so finding out about this little gizmo and then finding out that I was pretty much the last person in my knitting group who was clueless about a Weave-It was stunning to me! Apparently everyone (except me) played with this little loom as a child. I think I must have been deprived! Anyway, one of my friends, Happy One, was working on this little loom and recently showed off a beautiful blanket made from the little squares the loom makes. She was making it from left over yarn. And then I found an article in a magazine that featured the loom, the history and value of items made from a Weave-It. I had to have one - and the fact they aren't making them anymore didn't deter me one bit. I just had to have one now!! Turns out original ones from the 50s can be found on the secondary market, but eBay had a seller who made them - on a "Buy it now" purchase! Click! And it was mine. "Buy it now" was just made for me. Thank you HappyOne for teaching me this!! Today I made a day trip into Pennsylvania to meet up with 2 wonderful ladies who have been my friends for over 30 years. We met through our husbands - who worked together. Over the years we have visited frequently enjoying each others company and sharing our lives - jobs, our children, their growing pains, school experiences, their marriages, and grandchildren ... all the events of life. We continue to see each other a couple of times a year and sometimes even our adult kids join us - we must be doing something right if they choose to join us in a visit. And sometimes ... just us girls get together, like today. It is special to have these kinds of friends. I typically avoid using names in my blog, but Gerri has given me permission to do so. Gerri Bowen is the lady standing behind us. She is a published author. As long as I have known her she has been interested in writing and publishing stories. And she has been successful! If you are interested or curious, please check out her web site at the following link. Wednesday, August 25th (last week) was the last day that I was able to take my one hour walk. Today I pushed myself out the door first thing this morning. It was definitely a "push" because my body was sending me messages saying something like "Are you kidding me? Walk for an hour? Wouldn't it be better to check your email over a cup of coffee?" It was astounding to me that I resisted walking this morning. For weeks I looked forward to my walks. Couldn't wait to get out the door. Not this morning. Ten minutes into my walk I found myself enjoying it once again. Lesson: Don't allow a 4 day gap in walking. The body "forgets" and undermines you. And if I had missed this morning's walk, I would have missed the first signs of fall. I drive past this tree almost every day - but who would have seen the beauty of fall peeking through the green if they were only driving by. And what great stuff did I miss the last 4 days? This posting will be a bit dry so I thought a cheery picture would brighten it up a bit. So this is "A View from my Walk" picture - and it just proves that not all beauty and color in nature comes from flowers! I am nearing the end of the first month of this 20 year journey, and plan to look back and see how things are going around September 1st - but how to do that! Six goals out of 20 are published and without some method of review, it is just a list! Realistic goal setting for me has always been hard. Oh, yes, I can set goals easily and I love to set goals and make to-do lists, but I have the "eyes-are-bigger-than-my-stomach" syndrome - I set big goals and lots of them ... goals that usually aren't realistic in light of limited time. I am a Type A personality - I like to be the best, achieve the most, and control all the processes (i.e. do things without help and delegate almost never). I don't think these are positive traits anymore, but they have been part of me for as long as I can remember. As I have gotten older, I have given up some stupid stuff - my house isn't perfect and not always clean. I am not going for the slimmest body and I try very hard to not "lead" (having done that for a number of professional years.) But I do need sort through what can be tracked and what will be assumed. Let's start with the easy ones! Keep Learning - now things are getting harder. I have enthusiastically invited 3 things into my life this month that weren't there last month. So maybe if I blog about what I have done with these things for this year, maybe 3 times a month, I will at least show continuity. The downside is that I've invited 3 things in this month, but done nothing with them. More thinking, more thinking. Photo Family History - this is a long term, episodic goal. Over the last few years I have worked on this project during a September beach week. Beach week is when my kids and my sister's family go to the Outer Banks. I used to go on this trip, but mom can't make it comfortably, doesn't really want to go anymore and my husband doesn't drive so I don't feel comfortable leaving them behind without back up when I would be 6 hours away. So if I work on this project once a year during beach week, it counts. Friendships and Family - these are not objective elements. And up to now, they have been part of my life like breathing. I see family several times a week and friends socially every week, and email others. My blogging should be evidence of my commitment. I think these can be assumed to be valued at a high level already. So, the initial sort of where I am going and how I will assess my progress is done for now. I will be back around September 1 to look at this again. I can tell you right now - I have earned an F in some of this! Type A's don't get F's ... maybe I can consider this a "growth" opportunity as I force myself to relax into a Type B personality. No ... I am still a Type A. An "F" can't be translated into a "growth opportunity" no matter how you look at it! Another missed walk. I missed my Tai Chi practice this morning. The day was beautiful, sunny, cool, perfect for Tai Chi in the park and a long walk. But my body vetoed both since I slept until 8:30 am - unusual. I guess this was to be expected. I haven't slept well for several days this week. And there was no time left after getting mom breakfast to fit either in as other tasks were waiting. On my 45 minute trip into the city to get Milo I had some time to ponder the question of sitting vs walking. It occurred to me - I sit alot. I sit in the car - driving dogs to their destinations, driving mom or my husband to the store or the doctors or the pharmacy or church, and sometimes driving myself to fun stuff. I sit for my hobbies: knitting, spinning, reading, movies, blogging, iPad games, TV - every single activity I sit. So getting steps into my day is tough. Missing my walk - the step count is embarrassing. Now that I wear a pedometer all day, I can see how sedentary I am at times. The pedometer used correctly is an objective measure of how much movement I do each day. You can't really cheat the pedometer, unless you take it off and shake it, but then you are really just cheating yourself! I looked at the step equivalents for various activities on About.com. They had a huge list of activities and the step equivalents. You know, activities like swimming, biking, dancing, kick boxing, Tai Chi, and such. These activities raise your heart rate, count as exercise, but do not accurately reflect on a pedometer. One activity listed was sitting. Yes, I said "sitting". For every minute you sit, you can count 30 steps. uhh ... Really?? Can you look in the mirror at yourself and honestly say that 30 steps worth of effort was expended by sitting for a minute?? The car trip to Milo's house was uneventful. And as we were driving down a street in our neighborhood and onto our home street, he was just snapping pictures left and right! He is such a photo-bug! After lunch, I went to get Meaty and Grimmy. They will be spending the weekend with me while their papa goes to his campsite in southern Maryland. And after dinner, Milo's mama will be coming to spend the night. A full day of family and pets - some days you can't squeeze in a walk no matter what your plans. But sitting? ... Sitting always find a way to be part of my day. Need to find a creative way to change that balance! As of 2:45 pm - step count is 3274! Pathetic! As of 8:10 pm - step count is 5545! Still pathetic! And the "sitting step count"? - well I put 115 miles on my car today. The traffic was terrible and slow so I probably average about 40 miles per hour. That is about 3 hours of driving or 180 minutes sitting ... times 30 steps per minute = 5400 steps for just sitting in the car. Nope, I still can't do it. Life without friendships is like an uncut diamond. Yes, it is still a diamond - but it doesn't have the sparkle or beauty of diamond that is faceted. Why is it that some people have the gift of making friends? All my life I have been blessed with the ability to make friends easily. I wasn't the most popular kid, the smartest student, the prettiest girl, the most well dressed, wealthy, or athletic. So why was friendship an easy thing for me? I don't really know, but I am guessing that making real friends isn't based on any of those things. I do have 2 qualities that helped me. First, even as a child I seemed to have a kind of "radar" to avoid people who were not good for me and to cultivate friendships of those who made me more complete. I don't know were that ability comes from - maybe everyone has it, but some people may not listen to that small voice of warning. It has served me well. And so I am blessed with friends. There are a few that stand out above the rest, mostly because of their longevity even after long periods of separation. One woman has been a friend since the age of 6. We were friends until she went to private high school and I went to public high school. Fortunately we reconnected in college, and were close friends through our early married years, then drifted apart again, but now as seniors we have "drifted" back again. We share a history that spans our lives. That is a hard thing to ignore. Another friendship began in an usual way. I was engaged to be married and I volunteered to teach the equivalent of Sunday School for the year prior to my marriage. During that time I met a man who was committed to becoming a priest and a friendship sprung up. I think he said his first mass the same day as my husband and I took our vows. We couldn't attend each other's important life changing events, but the friendship continued. Our paths have crossed mostly through email over the years, but we are back in contact again ... just like nothing has changed. Of course in both these friendships, life has molded and shaped our opinions and they aren't always the same, but the friendships remain ... regardless. Another friendship was made more than 20 years ago. I met this woman in the workplace. We worked together, struggled together, suffered together and celebrated together through years working in the same area. We even competed for the same job - something that would have torn other friendships apart - but we survived it all and even though we have retired into different states, with very different lives, we are still friends. I miss not seeing her. And now as a senior, I am thrilled beyond measure to find that I still am making friends - my knitting group, my Tai Chi group - these relationships have grown and are evolving, and I am confident that "friend" will be the relationship I have with some of these wonderful people. Yes, friendship needs to be part of my next 20 years. I have watched several of my elderly relatives lose friendships to death, relocations, or just neglect, and fail to build new social circles - allowing their world to shrink. That won't be me. It's on my list of 20!! I resisted covering the topic of elder care - specifically care of an elderly parent. It is hard to be objective since I am a caregiver for my mother. I feel, however, to totally ignore this topic (which is a major part of my life) would be like omitting the color of your hair if someone were giving a description of you. And I do have a perspective to share. So I will comment on it now. Caring for an elderly parent is a slippery slope of declining health, poor decision making, resistance to change (even good stuff like hearing aids or a stair lift), loss of individual control, loss of friendships, loss of mobility, and the worst of all ... sadness - sadness that things aren't the same, can never be the same as they were, and that the roles of parent and child have switched - with you becoming the "parent" of your parent. Sadness and loss. Four years ago I moved my mom into my home. I had experience caring for 2 elderly relatives previously - inlaws and for short periods of time. I was not a rookie, I thought. I know the score. But this time I was caring for my mom and very early on I discovered that my previous experience didn't count for much. Caring for any elderly parent is one of the hardest and loneliest things you can do. Before she lived with me, I read several current elder care books, and I have since thrown them all away. To begin with, they all recommended not inviting an elderly parent into your home. I was appalled at this view of senior care. This was how it was done for ages (and in some cultures it continues). I felt strongly that this choice should be a viable one - even if it is the most difficult and complicated one!! I had one nurse friend who also discouraged me from this choice and once even implied that I was stupid for taking this step. It was a hurtful comment thrown out carelessly and I am sure that was not her intention to cause pain. And after four years taking care of my mom in my home I think I understand this point of view better, but as hard as this is, I would have made the same choice again. At the time I felt she should be living with family, and I still feel that way. Oh, we did discuss several options - discussed them for 2 years prior to her move here. But even then red flags were flying. She couldn't make a decision. Getting her to seriously consider any move (even though she made motions about doing it) got no where. Lack of decision making was the first red flag. She also had memory issues, and she was getting very frail. I worried that she had reached the point where others might take advantage of her if she continued to live on her own. Certainly at the beginning of the discussions, she had many independent options to choose from, but she delayed her decision until she could no longer take advantage of those options and her choices narrowed considerably. Nothing would be gained in the recitation of the things that drive me crazy daily. But I do have a wish list I would like to share. If you know someone who is caring for an elderly parent - their list is probably similar. Wishes are sometimes hard to grant - these wishes are toughies. I wish I had more help. I am surrounded by a wonderful family, but with the exception of my daughter and my husband, no one intimately understands how much of yourself you sacrifice to care for an elderly parent. Unless you have walked in these shoes, you can't truly understand. It is not my nature to ever ask for help. I believe if you are an adult son or a daughter (or even an adult grandchild) of an elderly parent, some things should be obvious - shouldn't need to be asked of you, shouldn't need reminders. That is what being an "adult" means. I wish my mother could have her life back. She has given up so much. Her independence, driving which restricts her freedom, control over her meds, control over her health choices, her financial tasks, her friendships, her physical mobility, even her ability to visit others overnight (she can't climb stairs) ... she is so restricted and so much is lost. While it is true that some of these loses could have been avoided, it doesn't change the fact that they are gone now. When my mother signed over her car to another family member I thought I would cry. Yes, she couldn't safely drive any more, and I wanted that car gone from our parking lot so she wasn't tempted ... but still ... I want her to have her life back. I wish I could have my life back. I wish my husband didn't have to deal with these daily frustrations, and I wish that we could have more time - just the two of us - in our own house. Yes, traveling away is fun, but sometimes just being at home is fun too. I wish friends who hold different opinions about senior care would keep those opinions to themselves. If you can't be supportive of an unselfish choice made by your friend, then you really aren't a friend. You are a judge - Caregivers don't need judges in their lives. I wish the decisions that I am forced to make on my mother's behalf weren't so hard to do at times. I wish she was more supportive of my efforts to help her. I wish I didn't have to be her "parent". I wish I wasn't creating a "wish list". Mom and I are like cookie cutters of each other physically. In many ways we are different in attitude, and we are very, very different in our approach to life. But watching her is sort of like watching me in 20 years - unless I do things differently now. There is one last wish I want to make. 10. I wish that my kids won't be forced into making a wish list in 20 years. I wish that with all my heart. I am working on that now. PS - Mom, I love you! A View From My Walk - on a previous day I snapped a picture of a house I pass by frequently. They always have a light showing in this window and I love the look of it. So inviting on a gray day! So this morning I was 30 in a field of 61 participants - right in the middle of the pack. That is not too bad for me on day 3 of the competition and a slow start (low step counts the first 2 days). But placement is a very fluid thing in these Walker Tracker competitions. Sometimes people don't get around to updating their step totals right away - so I could be further back in the pack. So I didn't sleep too well last night. Asleep at 1:00 am and up at 6:15 am. I was too wired up from yesterday. Today should be less eventful - a walk first thing this morning, shopping with Mike before lunch, a stop to buy dog food, lunch for mom, maybe get mom to the bank, probably a short rest in the early afternoon (I will start crashing with only 5 hours of sleep), and Tai Chi in the afternoon. And if I am lucky, very lucky, I can squeeze in some knitting. What I haven't been able to do is squeeze spinning into any days. My poor new spinning wheel! I wonder how my poor Meaty did last night. After yesterday, I am keeping my fingers crossed that his sleep was uninterrupted. Some days you just can't pack one more thing into it. The day started out pretty nice. I had a full night's sleep (not always the case). Today was knitting day with friends and some great projects were shared. The first picture shows the hem of the project I am working on - Sommelier Sweater by Mary Scott Huff. It has been slow going because so many other things have gotten in the way, but it is turning out pretty good. The second picture is a beautiful sweater being created by one of my friends. It is a work of art. I also received a gift of a knitted green book mark with my name on it from one of my knitting buddies. It is a lovely and thoughtful gift. I tried to take a picture of it, but I probably need natural light for the best shot. A beautiful afghan made on a Weave-It loom was displayed. I neglected to get any pictures of this wonderful item, but I didn't neglect to come right home and order myself a Weave-It style loom. It is a great way to use up all those partial balls of yarn. The picture belows show an article from PieceWork - a magazine whose focus is fiber arts and the historical aspects. Weave-It looms stopped being produced in the 1950s, but it is possible to get them on the secondary market or Weave-It style looms - which is what I purchased. After knitting, I went home, washed mom's hair, then I got her lunch. While she was resting, I took my walk for an hour. It was a cool day and it felt pretty good to walk in the middle of the day. Then mom needed a meds refill so we went to the pharmacy followed by a trip to my son's house to get Meaty and Grimace. The day was still cool and gray so I took the dogs for a long walk. Then dinner for everyone, and then we took another long walk. Finally, finally, finally ... we sat down to enjoy an evening of TV, knitting, and dog petting, when Meaty had a grand mal seizure at 7:45. While he is treated for epilepsy and we are experienced at handling this condition, each seizure is upsetting and very hard to watch. As he was coming out of the seizure, I gave him his rectal Valium (needed to prevent cluster seizures). Once he was on his feet, the aftermath of a seizure results in about 1 1/2 hours of confused pacing around and panting. We block all the stairs and doorways so he can't hurt himself while he is in this disoriented state, and I sort of follow him around to be sure he is OK (a grandma would do that). At 9:30 pm he finally fell asleep at my feet. Poor baby! 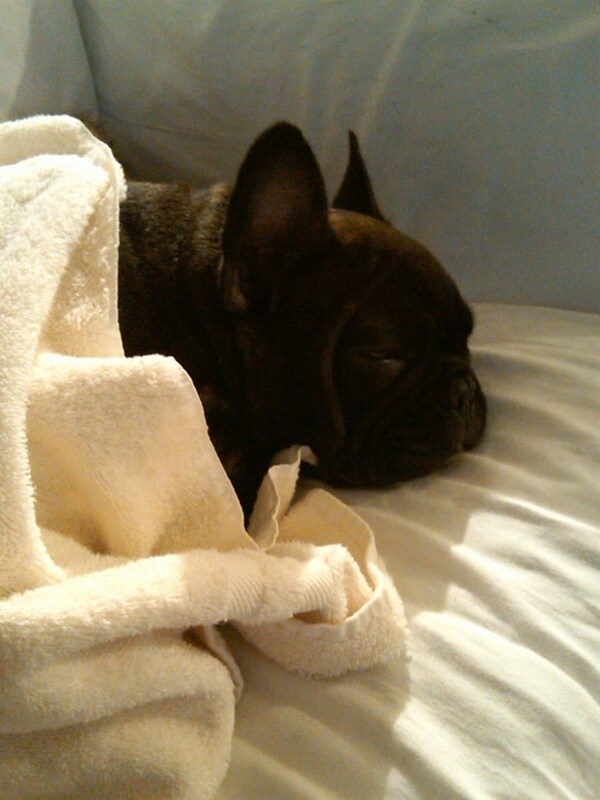 Then we made the trip home to his papa (who informed me that Meaty had a seizure last night too). On the way I almost ran into a full size buck (with a full rack) as I was merging onto the highway. I managed to miss him and his mate who was nearby, but I couldn't help but think that it was all part of the craziness that was today! So it is now 11:15 pm and I am getting my blog posting out. And then it is up the stairs to give Max his fluids for his kidneys - probably around mid-night. On balance - some good stuff and some bad stuff. Pretty much a typical unpredictable day for me. Hope your day was more unbalanced - toward good stuff! PS - I signed up for a competition on Walker Tracker. Last time I checked I was around 64th place. Today I checked and I am 25th place! Yeah! But it is possible that not everyone has logged their steps. I'll check again tomorrow morning and try not to be too discouraged when I drop to a lower position. I need to find out how many people are participating as well. Stats below. Lake walk and my feet! Severe boredom with walking around my neighborhood set in. I usually don't like getting in the car to go someplace to walk, but I am going to have to get past that. After 25 years living here, I am ready for new views. So, this morning my husband and I walked around Lake Elkhorn - twice. It took an hour. Come fall we should be able to walk to the lake, then around it and back home in about 90 minutes. That is my goal when the weather is more agreeable and my fitness levels are higher. I mostly wanted to see how the lake dredging project was coming. This man-made lake has not had any loving care since it was built. Development and storm erosion have caused alot of silt build up. Now millions of dollars are being spent for the restoration. Other man-made lakes in our city are being dredged or scheduled for dredging because they have suffered the same neglect. Lake Elkhorn is a beautiful lake - shaded paths, benches, a very large playground, various exercise stations and a small pier make it an idea gathering place. But the pictures I chose were of the lake itself - where there is no reflection on the water, there is a green scum. Sad. The lake has the constant hum of big machinery that works 24/7. In many ways the lake seems abandon by the wildlife and walkers that used to inhabit it. The work is supposed to be completed in December 2010. Then it should be born again as a gathering place for all living things. So here I sit at 8:45 pm adjusting to the quiet, and trying to deal with Wally, our cat, who has missed my undivided attention since Thursday when the 3 granddogs showed up. Although he makes a point of strutting through the living room when the dogs are here, (letting them know exactly who is the resident and who is the visitor), he doesn't stay long, and he never gets on the couch to sit by me. The weekend was filled with family and friends and pets. I often wonder why I book activities back to back on weekend days. The weekend just passes in a blur when I do that. Saturday we had our regular gaming group over. This group has been meeting monthly for probably 30 years. These folks were co-workers of my husband and over time evolved into friends whose lives we share. The group has shrunk as a few moved away and one died about a year ago (we are beginning to show our age), but the monthly game continues. Sunday we had a family dinner to celebrate my husband's birthday. We are not "big celebrators" of birthdays, but we do try to at least get together to share a meal and enjoy each other's company. And the house continues to be quiet ... I do enjoy quiet times (more and more these days), but it is the contrast between what it was like since Friday and what it is like now that always trips me up. No walk for me today either. But my foot is feeling better. I am looking forward to my morning walk tomorrow. And now Wally is asleep! I guess he is glad to have his couch back. Today was a day of rest and ice for my feet. This morning my right foot was alittle sore ... no walking today. Step counts for the day will be really low. But I did walk 5 days in a row this week - about an hour each day. Maybe that is my threshold - one hour a day at least for now. It is really a bummer, because with all other aspects (heart, lungs, legs), I could do more than an hour. I probably need to get new walking shoes as well. The day was filled with company. And tomorrow we will have a family dinner for my husband's birthday. I may not walk tomorrow. Two days of rest. I hope my feet are paying attention. Rest, ice and advil now - walking commenses on Monday! I guess it was inevitable. It appears that my four-legged grand-babies are restless and looking for alittle adventure of their own. When you looked at the label counts, my dog references far out weighed everything else. Meathead did leave a parting note. I promised to pass it on. You are the best grandma ever, but I have learned alot about blogging from checking out yours. We will be doing things differently. There will be no "goal setting". That sounds like work. I don't do that either. There will be no talk of hobbies. No thumbs - remember? Daily postings are out. We have lives. We have important things to do. Grandma, you might want to take a look in the mirror! 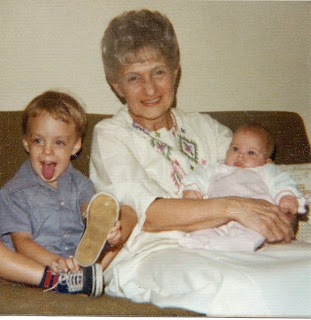 Anyway, love you bunches, Grandma! We grand-dogs had a heart-to-heart talk with our grandmother. We discovered that she was using our pictures and thoughts more and more on her new blog. Of course, this was natural since we are so charming, but we thought it had gone just too far. So capitalizing on our good looks and appealing personalities, we decided to (drum roll here!) launch our own blog. Besides, grandma needs to make a success of her blog based on her own merits. No more tagging on our coat-tails (even if our coats and tails are pretty dog-gone fabulous). We need to have total editorial control. And we will make an occasional guest appearance on her blog, but we are ready to strike out on our own. We need to keep this brief. Time's a-wasting! Our schedules are pretty tight today ... photo shoots, proofing content, maybe a manicure ... and we need to check out the cookie inventory. See ya later! A small touch of heel pain upon standing today. Crap! I know what to do for this, but crap, crap, crap!! I have Plantar Faciitis. About 12 years ago I developed heel pain when standing after rest. I self-diagnosed myself (went out to the web just like the rest of the computer literate world). I began using Burkenstock shoes - they kind of look like hippy sandals but they have great arch support. The first time I slipped my feet into them I thought I had literally stepped into a little bit of heaven. My feet were happy again - like instantly! I love instant fixes. I love Burks. For 10 years I "treated" myself using these sandals and for 10 years that worked ... mostly. Not a cure, but when I got a complaint from my feet, I'd slip my Burks on and "wa-la" ... instantly fixed (for awhile). Two years ago, the pain got worse - pain all the time even in my Burks. I was devastated. I was walking regularly and for long periods. I stop walking. The pain continued. Crap. My weight went up, and my emotional well being and energy went down, and I was not a happy person. It was podiatrist time. I convinced myself that it had to be something much worse, maybe a brain tumor!! (ok, so not really - besides, I couldn't find anything to support that diagnosis on the web, but pain can make you stupid, I am sure of that.) The doctor's decision - no to the brain tumor (he did sort of smirk) - and yes to "Chronic" Plantar Faciitis. Crap - chronic!!! I'd rather be chronically rich, or chronically smart, or chronically young! He recommended exercises (don't you hate it that exercise seems to be the cure for everything? ), physical therapy, rest, icing of the feet several times a day, and prescription orthotics. Now none of these recommendations fixed me overnight!! When I got my orthotics the disillusionment set in. I asked the assistant "so when will I be well". She said, "oh, give it 3 months." hmmm ... bad answer. When the doctor came in I asked him "so when will I be well" and he said "come back in 6 months and we will see how your pain is" (these answers were going in the wrong direction.) These folks didn't understand that I wanted "instant" - not 6 months. I complained. Too long, too long!!! He paused and got serious -"If I could put you in a wheel chair for 3 weeks - never, never, never on your feet - not even one time during the 3 weeks - you would be well faster - in 3 weeks. OR I could do surgery and cut your tendon and you would be recovering for 6 months to a year. But you would then be well permanently." As stupid as it sounds, I did pause - well ... the wheel chair was a "maybe" ... no ... that was an insane choice. It took a full year for these feet to get back to normal. Now a small little complaint from down south - a less than a 5 minute touch a pain in just one foot - which went away after standing for a minute - but a serious warning from down south! "Don't forget who is carrying you during all this walking. Don't forget to do your icing and exercises. And don't forget this message (and really pay attention here) ... I can "take you down" again, just like I did in the past." Respect the feet! I think I will rest and ice on Saturday! I bow to your generous nature. Really, I am just blown away that I have 9 public followers. 9!! I could think of about 5 people who "might" publicly follow when I started this blog. Only 2 of them did. So 7 of you have been a joyful surprise. I care for each and every one of you. I am having so much fun with this that I would do it even if there were no followers - but 9!!! Time is a very precious commodity these days. Thank you for spending some of your precious time with me. Today is dog day. Well, if you count all the days in the week that I have dogs, 5 out of 7 are "dog days" - at least during the spring, summer and fall. Today I get to sit and knit with my 3 charming canine companions snoring peacefully at my side, ... except for when I am taking Milo out to pee, or restraining Milo from badgering the older dogs, or digging around in Milo's mouth to remove random bird poop, or getting the dogs out for a group walk (which is the definition of a 3-ring circus, believe me), or corralling the dogs into the kitchen for dinner, and then it is quickly poop time and we need to examine Milo's poop to be sure it is the right consistency (don't ask!!). I really love Thursdays! Upon further reflection, I think I'll skip knitting. And before the end of the month, I plan to do some sort of a summary on how I am doing on these goals I sometimes talk about. An end of month self-assessment would help keep me honest. I don't want this blog to read like a self-improvement magazine article which tends to be worthless. I've listed 5 things that are important to me so far. There are others just chomping at the bit to be released from their "draft" status, but I will hold off until September. I need to pace myself. After all - 20 years is a long time - and yet, it will be gone in a flash - just like the last 20 years. Man, that was a depressing thought! Forget I said that. "Dear Gwandma, I'm a sad sad fwenchie. Mama gave me a bath! I was sooooo scared & I shook the whole time. I don't know why she'd do this to me, I've been a good boy. I played in the dog park with all my big dog friends. I even rolled in the mud like a piggy! Why would she do this to me. Come get me soon pleeeeaaaase! Your favorite grandbaby, Milo." Day 3 - Done! and maybe a 5th toilet?? Oh ... So glad I am done with this 3 day insanity. I usually clean for 2 reasons: company or I am upset! Yes, when upset, I head for the pail and mop and I scrub things. And I vacuum, dust and throw away things ... to excess. Once I cleaned the kitchen in a fit, filling 3 very large trash bags. Defiantly I challenged my husband to name one thing that was missing ... now, you should know that he cares not one twit about the kitchen, probably wouldn't have missed a thing if I had stripped the room bare. And I am not sure, but he may have backed slowly out of the room!! This time I cleaned because the house was driving me nuts! Thus ... the insanity. And I hope is done for the next 6 months (*sigh* - please don't insert any reality into this conversation - 6 months is what I am aiming for!) Maybe an outhouse in my backyard would help keep my 4 toilets clean. This one looks cozy! Wonder if the park would notice it was missing? Today's walk was rainy but very lovely. And other than taking a picture of the park's porta-pot (which caused another solitary walker to do a double-take), it was uneventful. It started out drippy and then progressed to a monsoon 10 minutes after I walked out the door. But no matter, I persisted. And I am glad that I did because I made my normal detour through my grocery store (wasn't raining in there), and if I hadn't persisted I would have missed these beautiful sunflowers on display in the store. You just have to look - there is beauty in even a rainy day. I love walking in the rain. The temperature is usually comfortable, no sun scorching heat - everything looks drenched by water (just like a big drink for everything) and quieter - gentle rain just makes things quieter. When I was in college I remember walking barefoot in the rain - no rain coat, no umbrella, no shoes - just enjoying the clean feeling of everything. Now my old feet need those arch support thingys, and I can't stand worms squeezed between my toes. ugh! I didn't worried about worms when I was in college. Were there worms? Am I really older than dirt? If so, it was before worms, because worms need dirt. I will know when my son starts reading my blog! He won't be able to help himself. He will comment: "Yes, mom, I have been telling you, you are older than dirt." Thankfully I have the two best "kids" and silly things are always said with love. It has been a good day. Hope your day was "sunny"! Day 2 - Two-thirds of the way there! Another wonderful morning walk. Great time of the day to do it and it really does launch you into the day with more energy. And the picture? Well, I have decided to include some photos that are "A View From My Walk". What surprised me was that - when you go looking for beauty, it is easy to find. And my walk passed too fast. I was sorry it was over after 65 minutes. Today I watched a runner pass me, and I couldn't help but wonder - do runners really "see" the world around them as they run? Or are they focused on how their body is performing, the next mile, the speed of their performance? I had a little time left at the end of yesterday, so I added 2 Widgets to my blog. One widget is to Walker Tracker, a web site aimed at walkers who use a pedometer. The link shows a brief summary of my step entries and provides a link to the website for more detail. If you are interested in this site, I am esknitter there - and my avatar is a picture of me when I was about 4 years old. The second widget is a Free Traffic Feed. This widget allows you to see the geographic location of the visitors to the blog. Pretty interesting. There is one other widget I am struggling to add - the link to MapMyRun - this is another activity tracking website that my family uses, and we sort of keep track of each other's efforts - not to badger or nag, but to encourage and motivate. I will track the details of my exercise on Walker Tracker and MapMyRun, and post summary info on the blog. Seems silly to track stuff in 3 places and the two sites do a good job. First floor cleaning of the townhouse almost done - just the powder room to finish. I will have some company this afternoon. Tuesday is Meaty and Grimmy day at my house, so I will pick them up soon. They are two old-timer dogs now so they don't mind me cleaning - just as long as I don't run the vacuum. ;-) Tuesday is also knitting meeting day, but I skipped it this week - didn't want to put any other road-block in the way of getting cleaning done. I really did miss it. Tomorrow will be Day 3 of this cleaning marathon. I need to finish up on Wednesday for two reasons: I am not really enjoying this, just want to be content in my own house again, and Thursday is Milo, Meaty and Grimmy Day. Nothing gets done when the 3 Musketeer Dogs are here! It felt great to get outside this morning and walk. I walked for 62 minutes, and I was just dripping with sweat! But I really was glad to start the day with that walk. It was just around my neighborhood (and I am pretty bored to death with the view), but I do feel lucky to have such a shady neighborhood. After 25 years of living here, the trees have all matured. And I took my walking tour through Harris Teeter - air conditioning and a big drink of water made the detour ever so pleasant. Then I got to work. I decided to divide my house in 3rds. I live in a townhouse with 3 floors, so making the division was pretty easy. My focus today was the finished basement. I had really hoped to de-clutter and clean, but I decided to focus only on cleaning and picking up stuff. And because that is the easiest part of the house to clean - it didn't take all day. So I vacuumed the first floor as well - the level that was causing me the most stress. There was pet hair (2 cats and 3 dogs worth) everywhere and to add insult to injury there was also copious amounts of leaves that were tracked in by people and the dogs. It felt good to get that cleaned up. Much more to do tomorrow. I do love things clean and picked up but I don't enjoy the actual cleaning. My mother-in-law (may she rest in peace) was an excessively clean and tidy person. Her home was her hobby. I think she truly did love cleaning. And she was a collector of things. All were art-fully displayed and dusted. If something was moved she knew it. It reminded me of a gift shop. When I met her, she lived in a 2 bedroom apartment. It was an older building with wood floors. Each year, she would get down on her hands and knees and she stripped off the old floor polish from the entire apartment with a putty knife (polish she put on her floor monthly). And she would wash all her walls and all the items in her house (she was a smoker). It took her two weeks in the spring. The first time I came to dinner I helped her hand-wash the dishes. I was doing the drying. I was dropping the forks into the forks slot of her drawer. She pointed out that her forks (and other utensils) weren't dropped into the tray, they were lined up - laying on their sides - in a specific manner. Her whole apartment was that way. Just so! I think it gave her some kind of peace to live like that - control over her environment maybe. She was a difficult woman to get to know, she had a hard life, she didn't really get along others that well - not even her son, and at her death she had few contacts or friends. And, yet, I think managed to be her friend, and she was a wonderful grandmother to my children. I think of her often when I clean. I miss her most then! Have you ever just needed to carve out some space in your life to get the delinquent everyday things done? Not the fun stuff - the things that make your life more livable and less confusing but get squeezed off your to- do list by other more pressing stuff. That is where I am now! So I cancelled all my plans for Monday through Wednesday. The calendar is empty. For those days I plan to start with a walk in the morning, and then begin at the bottom of my house and clean my way up. I know that sounds odd but the state of my house is adding to my fatigue. It is not clean and it is cluttered. Yes, this will take more than 3 days but it will give me a good start. Just taking a substantially big first step - forward motion - should help. And sleep ... I need to catch up on sleep. In fact I need to catch up on quiet time. Time when I don't have iPod ear buds in my ears - when I have just my own thoughts to chew on or nature for company. Just slow down my world a bit and re-group for a few days. So no day trip to my friend's house scheduled for Monday :-( , no knitting or knitting group, no tai chi practice, no blogging, no iPad game playing, no nothing (well, maybe in the evening I can knit a bit). And there are no doctors visits scheduled, no shopping, no bank runs, no vet visits, no meetings, and at present, no sick animals. And I'd say no spinning or reading, but despite my best efforts I haven't been able to do any of that for quite some time. Just walk and get my house in order for the next 3 days. Keeping my fingers crossed that I can keep to that plan! Glad this week is over - I think my eariler assessment - that "the week was still young" was prophetic. Murphy's Law needs to be abolished! Monday was a busy errands-day - stuff bumped from the previous due to dog surgery and recovery issues. Tuesday was knitting group (yeah), but by Tuesday afternoon things were going downhill rapidly. Meathead was displaying preseizure-like behavior - puzzling and worrisome. It resolved by 7:30 pm, but at 10:00 I heard that Milo was developing diarrhea. Wednesday was Milo's day. I travelled into DC to get him. Thursday (regular dog day) began with bad allergic reaction for Meaty - errupting across his whole face and into his forehead. For 45 minutes he miserably rubbed his face and ears against the rug and couch, rolled on his back to relieve itching any way he could. After multiple face washings and an administration of benedryl, he collapsed in exhaustion on my cool kitchen floor. But his face was rubbed raw and red, and terribly swollen. Thankfully breathing wasn't affected, but the episode was frightening. Friday morning his face was still badly swollen, so I picked the boys up early (for their regular weekend with grandma) so he would get regular benedryl. By Friday night, my daughter had arrived and I was really glad to see her - an extra set of capable hands. Today Meathead has a bumpy rash on his muzzle into his eye (rug burn? more reaction?). A vet this morning - Grimace to have his chest stitches out and Meaty to have his muzzle looked at ended with stitch removed and ointment for Meaty's face. All is settled this afternoon (knock on wood). As I write, Grimace is sleeping on the couch beside me, Meathead, Milo and my daughter are asleep on the floor (My daughter and Milo are covered by a sheet - pretty cute.) My mom is asleep on her chair. Much snoring is going on. Total steps: Tracked on Walker Tracker going forward. Tai Chi Practice - perfect!! 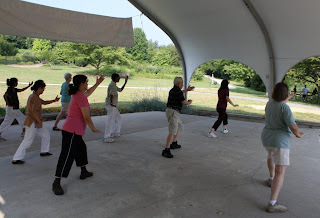 More Tai Chi practice !! 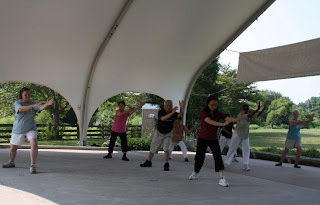 Today is another Tai Chi practice day at the park. Lately I haven't been able to attend these Friday morning sessions. Disappointing, but unavoidable. Here are pictures from a mid-summer practice session at the lake. The previous pictures shown on the August 3 blog post were taken during the spring. When you compare the two sets of pictures, it appears that we have improved over the summer. We are all doing the same step at the same time. While that doesn't seem like such a big deal ... it is. 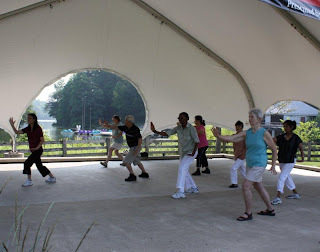 Anyone who has seen a Tai Chi group perform knows that performing in unison is part of the beauty and the discipline. Of course, our instructor tweaks our movements during class, but he let it slip that we were now an "intermediate level" class. We were thrilled. And at times I am sure he wants to take back that slip of the tongue. Too late, we heard it! Intermediate!! It is now cemented in our brains. Yes, perfect and intermediate. Now onward to the next level: More Perfect!! Looking at the last picture, you can see the beautiful lake in the background that is our view during these practices. We are so fortunate to have that view, to have our talented and patient teacher, and to have the friendships we have developed. I woke at 6:15 am with Milo at my side. First things first - we went outside for a quick pee (well, he peed and I watched). I don't want anyone thinking I pee in my front yard!! The sky looked more like night than dawn. Back in the house Milo had a tasty breakfast of chicken and rice grandma made just for him ... he is still recovering from a bit of diarrhea after all. We went back outside again for the more serious business of doing a poop. The sky looked darker (if that was possible) and it was now raining a bit harder with a little lightening high in the sky. I don't do lightening, but I do love a good storm. After Milo did his business (much improved over yesterday), I tried to get him to come in. He wasn't interested. He wanted to sit and watch my neighbors going to work. Now I usually don't find that interesting, but I do so cater to his whims when I can. So we sat on my small front covered porch and watched the sky light up and the rain fall lightly. It was a peaceful thing to do. I was glad he made me pause to enjoy a side of nature that I love - rain! It was a quiet time. "The quiet before the storm" it turns out, because now at 7:05 am we are sitting on the couch, he is asleep beside me and the rain is pelting the windows hard - thunder is rumbling and lightening just exploded outside our window - enough to make us both jump. I will check later to see what it hit because it was close enough to light up my shaded front windows with a very mean sharp boom! Very close. A picture would express a 1,000 words right now. Sorry I don't have one. I hope my friend who walks 6-7 miles early in the morning is watching this storm from the safety of her home! I do love a good storm - that one counted in the "great" column. I would say Milo and I timed that walk just right!! Most days I know what I am doing. (Or I do a good fake.) But things change on a dime at my house. Today was one of those days. Got a call last night from my daughter. Grand-dog Milo had loose stools. A puppy often has loose stools, but it is cause for concern because diarrhea when they are young can cause a rapid decline. And I had my son's two dogs Tuesday. Meathead (an epileptic) was acting restless with some unusual behavior all afternoon. In light of a recent change in his meds we suspect he had mini-seizure activity rather than his typical grand mal seizures. So getting a call at 10:00 pm about Milo just seemed to fit into the puzzle that was my day. This morning Grandma is going into town to pick up her Milo. Don't want another messy crate. His mom already had one of those when she came home work a few weeks ago ... a very sad Milo she found sitting in a mess. As my son is fond of saying ... we have the "broken" pets. Max, our cat, has degenerative kidney disease, and gets fluids every other day with the prognosis of a shortened life span. Meathead has epilepsy diagnosed at age 3 and has been on meds. Grimace had a fatty tumor removed, and we are waiting on the biopsy. Milo seems to have problems producing a solid stool much to the chagrin of his mom. Wally, our other cat, motors on without problems - well, his problem will be when he is weighed at the vets, and then we get a weight loss lecture. I think vets should be required to address weight issues with the animal directly! This dressing down of the pet owner for the "chunky-monkey" pet they brought in is just unfair - probably unconstitutional! I think that owners of "chunky-monkeys" everywhere should write their congressional representatives and make their demands known. No more taking the blame for "chunky-monkeys"!! Sorry, it has been that kind of week (and it is only Wednesday - the week is still "young")!! Never too hot to knit ... indoors! We love to knit outdoors where we can enjoy the warm weather and the wonderful surroundings. And casually capturing the interest passers-by is especially fun. BUT when the outdoors is like an oven and a sauna combined, we say "uncle" and move indoors to a local air conditioned mill. Today our meeting was especially eventful. We are in the midst of a political season and the "passers-by" were not interested in knitting, but our votes. We were happy to talk with them. And one person who was with the entourage did express an interest in knitting. I heard one member of our group sharing the dates of the weekly meetings with her! Yeah - Go Team! Spread knitting "bug" as far as it can go! As you an see from the pictures, we didn't let these political folks distract us too much from our knitting mission. The picture below does not do justice to the beautiful knitted piece being examined. We are one bunch of talented knitters, even if I do say so myself. I sure do love this group!! Blogging was an experiment! Looking at the result of this experiment from a distance - I am hooked! I love having one place to connect with people - family, friends, friends I haven't met yet, and other blogs that I follow. Blogging feels like you are making contact with everyone in one step rather than multiple emails and phone calls. And it gives me an opportunity to sort through and document the things that are important to me - sort of like a diary with pictures only better somehow. It is such an efficient and fun method of communication. After only 14 days blogging, I am reorganizing, adding new pages and page tabs of the top of my page to reduce the side bar clutter (Reduce Clutter - a goal I haven't shared yet - a future posting). Separate pages and tabs ... somehow I discovered this option while poking around in the site. I am sure other things will evolve as I discover new stuff. This has been a wonderful opportunity to exercise my brain and learn something new. To those who "follow me" publicly (your avatar shows in the side bar under Followers) - thank you! There are 5 of you right now. I am in awe of blogs where there are 50 or 100 followers (and even more). I love the fact I can see who is there. And to those who aren't followers, but sometimes comment on a posting, thank you. It is so much fun to see a "new face" pop up in the comments field. I have discovered your blog through your comments, and I enjoy "visiting you" there. And those who visit my blog, but never make their presence known in any way, I am happy you are stopping by and please say hi occasionally. Yesterday, after blogging, I got ready for my walk. It was 88 degrees out - warm - but not too humid. I had missed walking for many days. I wasn't accepting the excuse that it was too warm to walk today. I would carry water. And I try to carry my camera now, and I always carry my ipod, keys, and tissues. It was more stuff than I could carry in my pockets. So I went in search for a fanny pack I purchased years ago for walking and hiking - the one with a pouch for carrying water and pockets for other stuff. After digging it out of my closet I made two rather unsettling discoveries. First, it was covered in dust. Dust!!! Had it been so long since I used this fanny pack? Apparently so. I had to admit that we hadn't done much hiking, and although I had been walking regularly about 1 1/2 years ago, I don't think I used this item then. No matter. I dusted it off, cleaned out the pockets, washed the water bottle and filled it with ice water. I was ready to roll! I tried to strap it on my waist. It was too tight! Like REALLY?? Too tight over summer clothes? (and probably too tight over no clothes, but I wasn't walking in my "birthday suit" just to avoid adjusting the belt). I remember pausing for a moment - thinking that something was caught, twisted, bunched up - something making the fit snug. I even consider the possibility that the nylon belt had shrunk while in the closet. Yes, that must be it! Shrinkage. I felt better! And so I went for my walk - 55 minutes - warm but do-able, and although nothing interesting happened while walking, I was glad that I persevered and took that walk. Today will be too warm to walk outside, so I will walk on my treadmill while watching a spinning fiber video, with cool air from a fan and air conditioning. And no need to wear my fanny pack today. And for those who suggest that I need a "reality check" for that nylon belt, I say no. Reality is an overrated state-of-mind. Aggie (Agatha) has been born!! My spinning wheel has a "birth-mark"!